Hot , hot and hotter still. Despite which, the fish have been active and willing to take a fly, to all but the most inexperienced anglers. 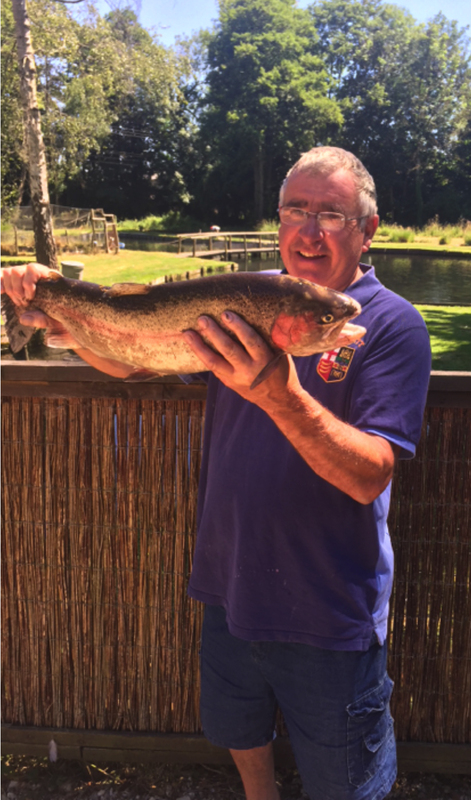 We note our 8lb Rainbow last month was “Fish of the Month” in the Trout Fisherman. I certainly seem to have spoken too soon regarding numbers of anglers. May was a busy month, whereas June was quiet. Whether the weather, or Football or price (which hasn’t increased for 8 years) or for whatever reason, Avington has been quiet in June. You don’t need to believe me, you can ask to look at the bookings diary on the front desk, to see for yourself. It is of little comfort to hear yesterday from the two EA license inspectors that all the other fisheries to which they called were either quiet or empty. Fish farms too are having to struggle with excess stock as orders for restocking have fallen. I have always been a little shy of gimmicks at Avington, but I have agreed to buying 1000 Tiger Trout to be stocked this coming winter. Fisheries need to survive, and we will see what interest the Tigers have over the next few months, to increase footfall. Can we talk about something else? What is a “Big Fish” fishery to you? We stock 4lb fish, and upwards. They are stocked by eye and therefore it is possible that the odd fish under 4lbs slips in. Keep it but don’t count it, has always been our instruction. Please believe me, we wouldn’t knowingly give away 3+lb fish. Even a 4lb fish is a big trout. You have never caught a wild trout of this size, and it costs money to get a trout to 4lbs. Let’s say £1.75 per lb weight to get to 4lb. To get to 5 lb costs £1.90 per lb. To get to 10lb will cost at least £5.00 per lb, and a 20lb Rainbow trout would have a market cost for stocking of £50.00 per lb. ( £1000.00) At Avington, we also rather hope that you look at the quality of the fish and it’s condition. Plus the fact that the waters are chemical free and the flesh of the fish makes wonderful eating. During the month Tim Tolle age 12, from Kingston-on-Thames came with his Grand Father, Rolfe, and caught these two beautiful Rainbows. He had a couple of hours tuition from one of our resident instructors, and despite his first time fly fishing caught these beauties. Michael Haynes caught this beauty. A 7lb 8oz Rainbow.